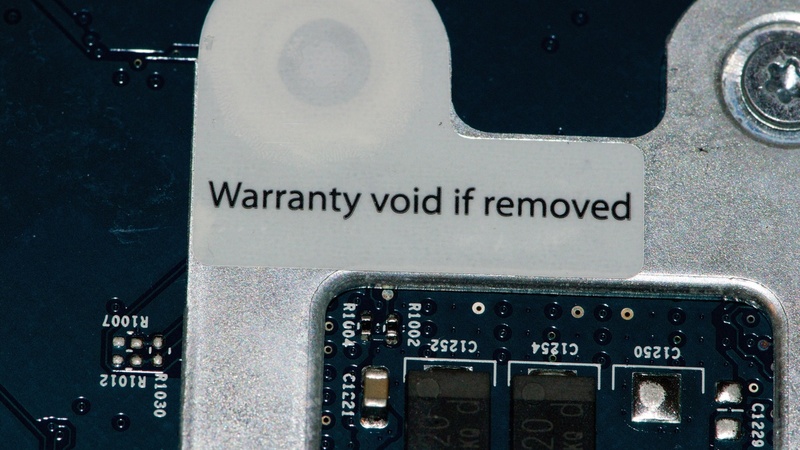 'Warranty Void If Removed'? As It Turns Out, Feds Say Those Warnings Are Illegal : The Two-Way The Federal Trade Commission says tying warranties to the use of specific parts or services is prohibited. And the agency has told six companies they have 30 days to fix their ways or face penalties. Oh, you've seen them before: those little stickers or tags making clear that if you want your warranty on a product to remain valid, you'd better leave one or more of its parts untouched. The idea, of course, is that consumers are barred from using third-party parts and repair services for the product if they would like to hang on to that guarantee. Well, as you've probably long suspected — or desperately wished, at least — those warnings are bunk. Worse than that, actually: The Federal Trade Commission says they're illegal. "Provisions that tie warranty coverage to the use of particular products or services harm both consumers who pay more for them as well as the small businesses who offer competing products and services," Thomas B. Pahl, acting director of the FTC's Bureau of Consumer Protection, said in a statement released Tuesday. Specifically, the agency explained, those provisions violate the 1975 Magnuson-Moss Warranty Act, which bars companies from conditioning their warranties on demands that consumers use certain articles or services in connection with the original product. That hasn't stopped companies from doing it anyway — and now, the FTC is fed up. The agency said it had "sent warning letters to six major companies that market and sell automobiles, cellular devices, and video gaming systems in the United States." The FTC's announcement did not identify the companies by name. "Sony's warranty states that 'this warranty does not apply if this product ... has had the warranty seal on the PS4™ system altered, defaced, and removed.' "
After this story's publication, a Hyundai Motor Co. spokesperson acknowledged the FTC had indeed reached out Tuesday with concerns about some of the language on its website. Hyundai said it is "currently revising" the language to address those concerns. "The language on the website was part of a consumer awareness campaign to inform Hyundai vehicle owners of their rights after a collision to ensure that their vehicle is restored to its pre-collision condition," the spokesperson said in a statement emailed to NPR on Thursday. "This language does not appear in Hyundai's written warranty terms or anywhere else on hyundaiusa.com." And the company apologized for "any confusion this may have caused." The FTC has given the six companies it contacted 30 days to correct any potential violations on their websites. If at the end of the month those violations persist, they "may result in law enforcement action." And in the meantime, have no fear the next time you see one of those stickers: Know that when you peel away, the law's got your back.